She's Fantastic: Bowen Designs BIONICA! Randy Bowen is a name synonymous with high quality products in the world of pop culture collectibles. I think it's safe to say that most toy collectors have, at one time or another, splurged on a Bowen statue. I have several busts in my collection and a handful of statues on my wish list. He was the first superstar sculptor I ever became aware of. He may actually be the pioneer of the character statues and busts that fill glass cases in every comic shop today (although that's hard to prove outright.. this man desperately needs a detailed wiki page!). This figure is a nice surprise. It's actually the only Bowen Designs action figure I've ever heard of. 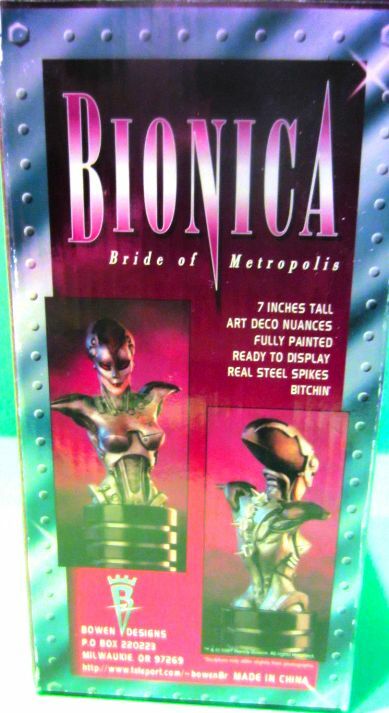 Technically she is labeled as a "fully articulated statue," but c'mon, she's plastic and has lot of joints and accessories - plus she comes carded behind a plastic bubble - totally an action figure! 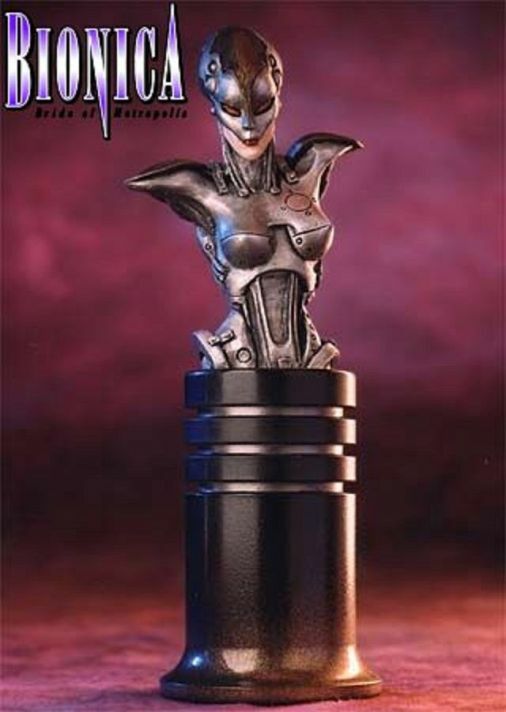 Bionica is an original creation by Randy Bowen himself (Bowen Designs employs many different artists, but this is all him) and is an amalgamation of Maria from Metropolis and Bride of Frankenstein. Let's check her out in detail below! This action figure is very tall, measuring in at 8.5". But, hey, she's a cyborg, so she's allowed to be huge... plus she's wearing some crazy Alexander McQueen-style shoes. 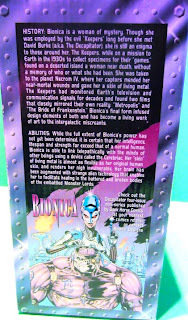 Bionica has light-up eyes that work by depressing the button on her left temple. My batteries are dead unfortunately. Also, my figure has an issue with her left "neck cable." On a perfect figure, the two cables would be symmetrically curved like her right one. Mine only stays out for a second before it pops back in to rest against her neck. I'll hit it with a heat gun to see if I can get it to stay. Her back spikes are made from a flexible black rubber. Bionica comes with some pretty cool accessories: a figure stand, "Frog Alien", "Brain Guy", and several testtube-like pieces. 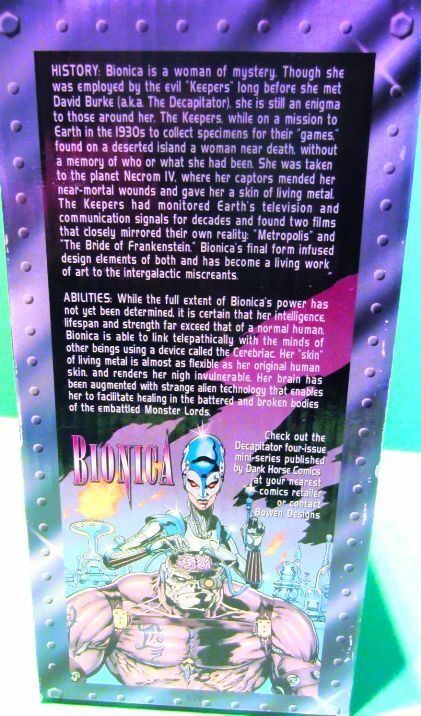 (Note, the accessory characters were sculpted by Randy Lambert, while Bionica herself was sculpted by Randy Bowen). Bionica features 12 points of articulation: Head, Shoulders, Elbows, Wrists, Waist, Thigh Cuts, and Knees. Her tall stature and lack of ball-joints makes he posing a little stiff, but it works with her robotic nature. 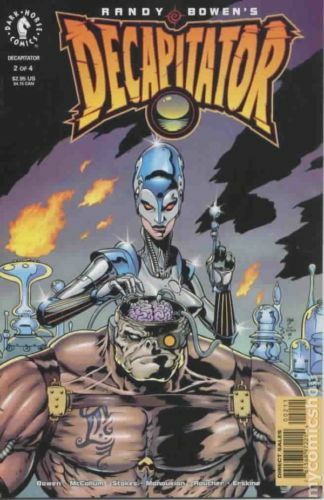 Bionica was a character in Randy Bowen's 1998 Decapitator series published by Dark Horse Comics. Here are some images of Aztec Toys' Silent Screamers: Reel Masters Maria (from Metrolpolis), one of the major inspirations for Bionica. I'm certain I own this toy, but I was unable to find it for this review. She is gorgeous. I love the spine in the bell jar that comes with her. I am a sucker for those kind of accessories. Thanks for letting me know she existed. Glad you liked her! Yeah the Brain Guy and Frog Alien are awesome (that's why I was sure to give their sculptor a special shout out). I think the green testtube accessories glow in the dark, too, which is an added perk. That is a fantastic looking figure. 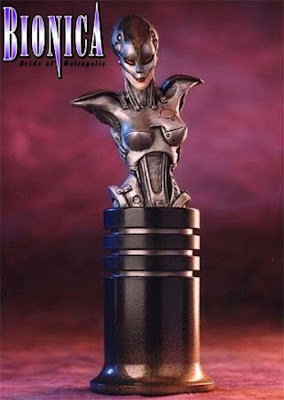 I recall watching Metropolis at school & thinking how cool it would be to have a Maria figure. I'll have to hunt down that one pictured above. 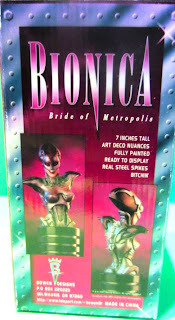 The accessories & base of Bionica are very cool. I haven't seen my Maria in years. Perhaps I got rid of it. I remember being disappointed with her, but I can remember why. 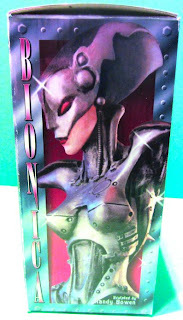 But now that I have Bionica and few other similar-looking fembots I may have to hunt her down again. Yeah bionica looks cool, specially the accessories. I do have Maria and i agree she wasnt great. It was the face and the weird flat palms, that didnt work so well. I am still happy she was made thou as i love the movie, specially with the Queen soundtrack. I need to watch Metropolis again. It's easily been 15 years since I've seen it (and I honestly didn't really appreciate it then). I feel like I'm going to have to re-buy Maria if I can't unearth her in the next month.